Robert Neff & Sons, Inc. is a family owned and operated trucking company. We have been in business since 1931 and are based out of South Zanesville in Central Ohio. 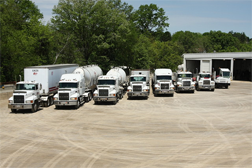 Robert Neff & Sons, Inc. is a multi-faceted, fully insured trucking company that offers equipment such as vans, flats, lowboys, and dump trailers as well as dry bulk tanks. Wrecker, grapple, and oversized load hauling and rigging services are available. Our highly skilled staff is committed to providing "On Time Service". We would like to quote your business for rates or provide assistance in any way possible.